When you're out hiking all day the last thing you'd want to happen when you get back to your campsite is for you to not have a source of light. Whether a full moon, fire, flashlight, headlamp, lantern, or any combination thereof, once the sun sets you'll need a reliable stream of light for setting up your tent (if you haven't already), cooking, and other campground operations. Don't trust your phone to not run out of battery when you've been snapping pics all day. And it's a little annoying to hold a flashlight the whole time especially if you need your hands to do stuff. That's why it's nice to have a rechargeable headlamp and camping lantern that you can use, it makes for a more enjoyable trip to the outdoors. Camping lanterns are reliable and they cast a perfect, broad light across the whole campsite as opposed to a focused beam of light like from a flashlight or headlamp. We've had great experiences reviewing and comparing several high quality lanterns during our recent camping trips, which is why we're taking the time to share our choices for the best camping lantern on the market. Keep reading to find out which camping lanterns people are raving over these days. What’s the Best Camping Lantern For the Price? We've made the decision process easy for you by picking out the 5 best camping lanterns on the market. Read on and decide for yourself which camping lantern is the best for your needs. Get it delivered in time for your next camping trip then and go out and have a great time without the spookyness that comes with a dark campsite. The Lighthouse 400 doesn’t just look like a mini transformer but it performs like one too. There’s more to this lantern than just it’s quirky design though. 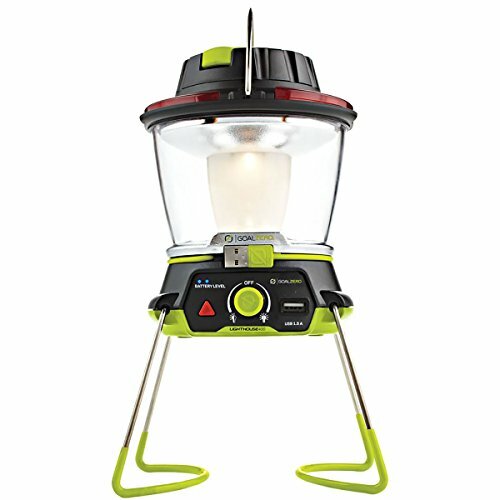 So what makes this the best camping lantern? If you're traveling full time and need to charge your lantern on the go we recommend solar panels but what do you do if you don't have solar and run out of battery? That’s where the hand crank comes in handy. On the lowest setting, a minute of cranking gives you light for up to 10 minutes (low effort, high reward). If you’re still worried about saving battery, use the half power setting instead of full power. Both the turbo setting and the dim setting both brighten up the whole campground when we tested it. Also, the stand lets you set the lantern at a heightened position for better illumination. And since it’s collapsible, storing it is hassle-free. But while that’s all great, what's the oomph factor that puts it above the pack and makes it one of the best camping lanterns money can buy? That's where the 4,400mAh battery and the 1.5 USB port come into action. It allows quick charging of mobile devices like your phone or even your GoPro, ensuring you never miss out on capturing that perfect moment because your camera ran out of battery. When we call Lighthouse 400 the best camping lantern, we sure as hell mean it. This one’s worth the premium you pay. After all, how many lanterns can charge your phone too? Would you rather avoid the hassle of charging and go with a gas camping lantern instead? 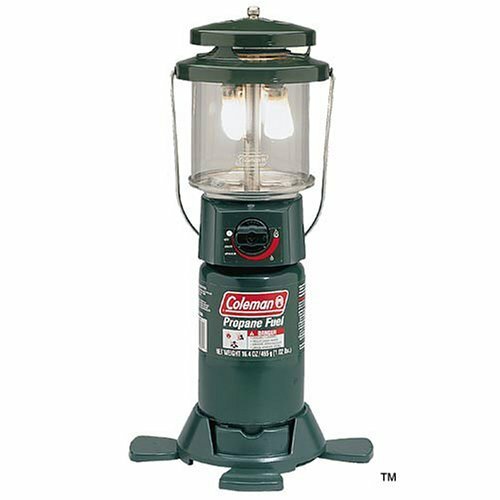 Then the Coleman Deluxe is just the lantern you've been looking for. It's in the running for the best camping lantern because it's low tech, which means there are less components that could break and this lantern can possibly last you a lifetime. Nothing matches the run-time of a gas powered camping lantern and unlike most gas lanterns, the PerfectFlow can be lit in seconds using a matchstick. With a 16.4 oz. propane tank, the lantern runs for 7-15 hours depending on the setting you have it at. The 2 mantles and dimmer knob on the Coleman Deluxe PerfectFlow provide you full control over the light generated and battery used. Secondly, the porcelain ventilators prevent rusting making it the ideal lantern for harsh weather (no rain will spoil this baby). Lastly, the legs provide a strong base and support on the rockiest of terrains and are foldable for easy transport and storage. The gas tank needs to be purchased separately which adds to overall cost of owning this lantern. Also, it’s slightly heavier and bigger but it’s unmatched durability and convenient features make it worthy of being called a best camping lantern. 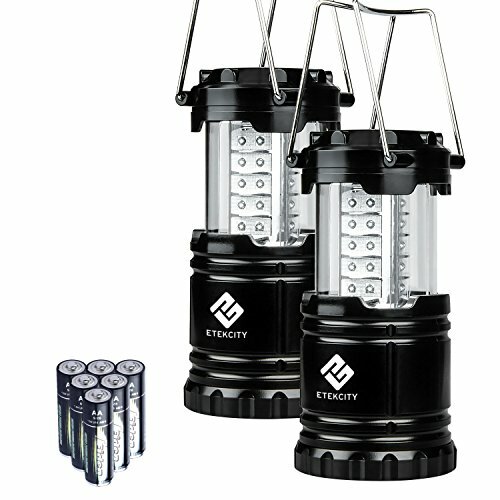 Yup, you’ll score 2 lanterns for a low price but that isn’t the only reason the Etekcity is a best-selling camping lantern. Runtime of this camping lantern varies from 10-12 hours depending on the brightness level you choose. There’s plenty of battery for the entire night even on the full setting. The lantern's collapsible body and it's light weight means that carrying it doesn’t get any easier because it can fit right in your backpack. But just because it’s light doesn’t mean it compromises durability. This lantern is taken care of by it's military grade plastic. Cementing that is the whopping 10-year warranty that comes with it. The 30 LED lights generate enough brightness to light up your entire tent/campsite and can be controlled by adjusting the lantern’s height. The Etekcity LED Lantern may lack the fancy frills other lanterns have and you'll need you to carry additional AA batteries but considering it's rootin' tootin' low cost, it’s a versatile and best camping lantern. If it’s camping, the Coleman brand is going to be involved. That's why we have two Coleman lanterns on our list for the best camping lantern. 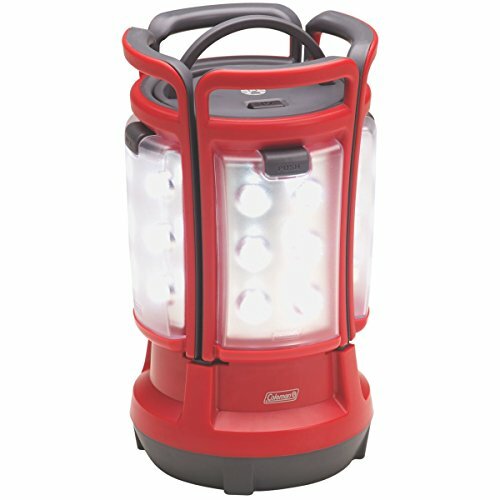 The Coleman Quad is one of Coleman's best LED lanterns. It combines literally 4 smaller lanterns into one. Each side of the lantern (4 in total) is it's own mini lantern that can be separated and used on it's own, making it an ideal camping lantern for a family. Forget the hassle of charging. The 8 D batteries will keep your campground bright for up to 75 hours (no, we’re not kidding). Also, as I already mentioned, you can disassemble each of the 4 sides of the lantern and use them separately, with each of them having a runtime of 1.5-2 hours. The panels can be charged on the base. The 4 individual lanterns in tandem generate 188 lumens and create a 360 lighting ensuring there’s be plenty of light in and around the campsite. Each lantern comes with an individual handle and weighs a mere 1-1.5 pounds making it light and portable. Be it rain, snow or extreme heat, the Coleman Quad is built to last against wetness and comes with a 5-year warranty to back it up. And if that wasn’t enough, the LED’s never need replacing. That's what makes this Coleman a best camping lantern on the market. The 8D batteries can make the lantern base heavy and add to the overall cost but for the 75-hours worth of run-time, it’s not a deal breaker. Last but not the least, the fifth best camping lantern on our list comes this handy Streamlight 44931 lantern that combines both utility and affordability, making it the ideal mid-range buy. Another workhorse in the stable, the Streamlight 44931 lasts up to 295 hours with the help of 3 D-cell batteries. Also, since the lantern has a battery indicator, you'll never be too late or too early when changing the batteries, which is what sets this one apart as one of a top choice lantern for camping. Even with little to no light, changing the batteries is easy with the aid of the keyed battery door. The 5 modes let you control the brightness while the red SOS flash comes in handy in case of an emergency. It can also be submerged to up to 1 meter in the water without any damage so you can take it for your canoeing camping trips as well, making it a strong contender for the best camping lantern. On the downside, the D-cell batteries need to be purchased separately. It’s also slightly bigger and heavier compared to a few other models on the list but considering it's excellent features the Streamlight is worth a consideration as the best camping lantern. Which Camping Lantern Do You Think Is the Best one? That's it! Our top recommendations for the 5 best camping lanterns available online. We hope we provided you with enough information to make an informed decision because we want you to find a great camping lantern so you can have an awesome and safe camping trip. So thanks for reading and let me know if you have any questions in the comments below. If you're looking for a awesome place to go camping, look into national parks like Yosemite, Grand Canyon, or Joshua Tree.